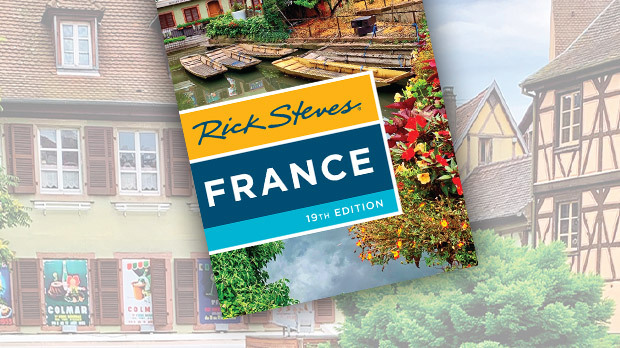 The French province of Alsace stands like a flower-child referee between Germany and France. Bounded by the Rhine River on the east and the Vosges Mountains on the west, this is a green region of Hansel-and-Gretel villages, ambitious vineyards, and vibrant cities. Food and wine are the primary industry, topic of conversation, and perfect excuse for countless festivals. For centuries the region flip-flopped between Germany and France, depending on who won the last war. The Germans believed the mountains were the natural border, while the French thought it was the river. It's interesting to think that this is a kind of cultural continental divide, creating a fascinating mix of French and German culture. That's why you find people here named Jacques Schmidt or Gunter Dubois, and the wurst comes with fine sauces. Alsace's best city, Colmar, is one of Europe's most enchanting. I absolutely love Colmar. The town's distinctly French shutters adorn ye-olde-German half-timbered buildings, giving them an intriguing ambience. Historic beauty was usually no excuse for being spared the ravages of World War II, but it worked for Colmar. The American and British military were careful not to bomb the old burghers' houses, pitched red- and green-tiled roofs, and cobbled lanes. Today, Colmar's antiques shops welcome browsers, homeowners fuss over their geraniums, and hoteliers hurry down the sleepy streets to pick up fresh croissants in time for breakfast. Each Tuesday, folk dancers and musicians from a nearby village share their talents on the town's main square — a fun and free slice of Alsatian culture. On a visit here you'll enjoy great cuisine, lovely white wine, and a proud heritage. Colmar also has incredible art. The Unterlinden Museum holds Matthias Grünewald's circa-1515 Isenheim Altarpiece — one of the most powerful paintings ever produced. The altarpiece is a mind-blowing polyptych (a many-paneled painting on hinges) that was designed to help people in a medieval hospital endure horrible skin diseases long before the age of painkillers. The painting tells Jesus' story — from Annunciation to Resurrection — and patients who meditated on it were reminded that they didn't have it so bad. Using Colmar as a springboard, it's easy to tour the region. Alsace's Route du Vin (wine road) is blanketed with lush vineyards and dotted with delicious, picture-perfect little towns. You can drive, hike, bike, hire a taxi, catch the bus, or join a minibus tour like I did on a recent visit (about $70 for a half-day). Alsatian villages nestle in valleys on small rivers, which medieval villagers broke into canals and used to power their mills. Kaysersberg is one of the most charming stops along the Route du Vin. 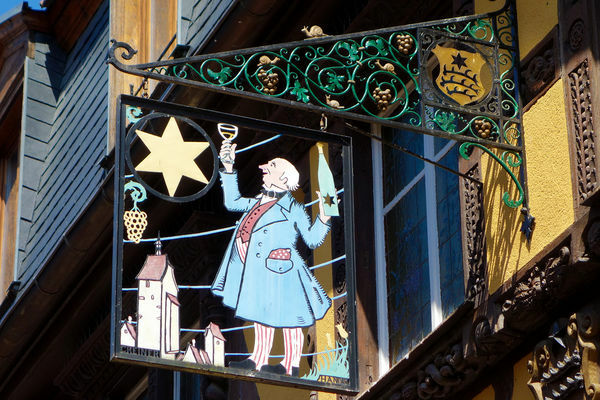 As you wander the cobbled streets below the half-timbered houses, you may find a sign with a picture of a wine-swilling fellow, which marks what was once the mansion of the town gourmet. I'd never known the original meaning of the word "gourmet": Each city in a wine region (like Alsace) had a man appointed to rate and price wines, and to serve as the middleman between vintners and the wine-drinking public. He facilitated the sale of wine…and knew that having quality food to pair with the it would help. Eventually he became the man with the finest food in town, or the "gourmet." The actual job of the gourmet survived in Alsace until the 1930s. Like the gourmet of old, those visiting Alsace's Route du Vin today make a point to try the local wines. Thanks to Alsace's Franco-Germanic culture, its wines are a kind of hybrid. The bottle shape, grapes, and much of the wine terminology are inherited from its German past, though wines made today are distinctly French in style (and generally drier than their German sisters). Local vintners offer a warm — and liquid — welcome. The Caveau des Vignerons de Kaysersberg represents 150 winemakers from around town and offers free and easy wine tastings with experts who speak "a leetl" English. In the village of Eguisheim, it's a treat to visit one of countless cozy wineries, such as Paul Schneider's independent winery, located in a one-time hospice, now run by a third-generation family winemaker. And on my most recent trip, my guide took me into the fragrant cellar of Eguisheim's Domaine Emile Beyer Winery, where enormous wooden barrels age white wine, a method rarely used in modern times. Until the 17th century, Alsace produced more (and better) wine than any other region in the Holy Roman Empire. Investments in the region then financed many of the beautiful buildings and villages we see today. 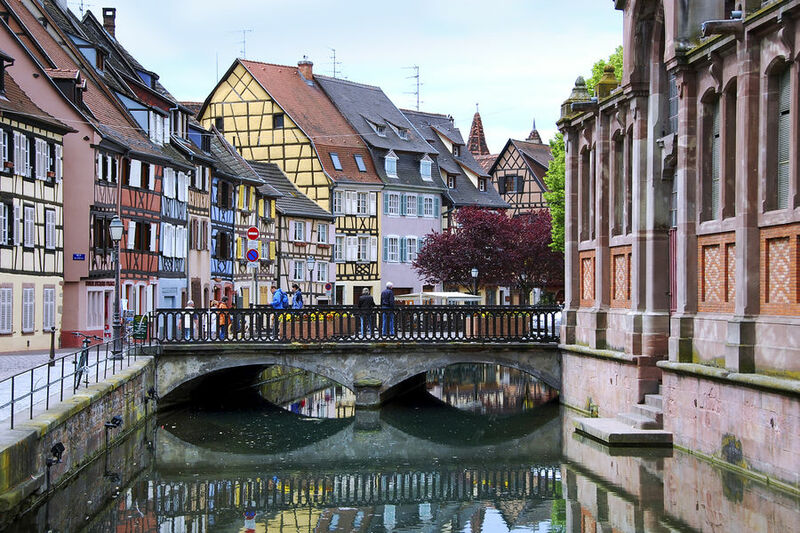 You'll get the full benefit of that history by staying in Colmar — still one of Europe's most enchanting cities — and meandering through the delightful and charming small villages that dot the Alsatian wine road.